It's time for a new month to begin. Hopefully, also the end of snow and beginning of warm, sunny days. One a couple of these nice days we've had, I've been taking Mom for a walk after lunch to get some fresh air and exercise. It's been so nice to get out and about. If I'm not in the Shop, not to worry, I'm probably out walking Mom and will be back very soon. It doesn't take me long. I'm only taking her around the block. Grandma will be in the Shop to help you. I've got 2 important things to tell you about. First, We will be changing our SATURDAY HOURS ONLY. Starting May 5th, our NEW SATURDAY HOURS WILL BE 10AM-3PM. Second, Our FREE PATTERN AND DEMO DAY will be SATURDAY, MAY 12TH.This is the second Saturday. We had to change it for May only. Mom & Grandma will be out of town this weekend. Denise will be running the Shop for us while we're gone that weekend. 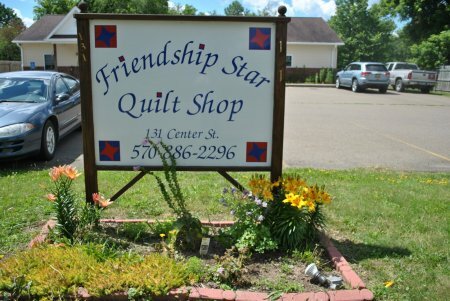 This weekend, Mom and Denise will be vending at the Corning Quilt Guild's quilt show at Watson Homestead. The Quilt Show is 10a-5p on Saturday and 10a-4p on Sunday. Admission is $5. They will being having some good deals for you at the quilt show. I will be here at the Shop with Grandma. Dogs are not allowed. Personally, I think it's wrong to not allow dogs to quilt shows. I bet some dogs, like me, who would love to go to quilt show. This Saturday the Shop will be open 10a-4p. Since it's going to be a rainy, yucky weekend, it would be a great weekend for a road trip to a quilt show. Just a reminder, we have 25% OFF CIVIL WAR REPRODUCTION FABRICS until Monday, April 30, 2018. There is a minimum of one (1) yard cut on sale fabrics. May 4th Only 25% OFF STAR WARS FABRICS. Minimum one (1) yard cut. I think I've covered everything for May. Don't forget Mother's Day is coming up soon. Stop in and pick out your Mother's Day gift.